When living space is at a premium, it’s time to get creative. We all enter homeownership with a list of ideals and wishes but sometimes it’s hard just to shoehorn in the bare essentials. With enough ingenuity and vision though, it’s possible to make something practical and beautiful within seemingly unrealistic confines. 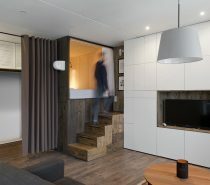 These four small apartments exhibit four different design solutions to make life fit comfortably within their walls. Discover a lofted bed over a living room, an extravaganza of a storage wall linked to a dedicated home office area, a glass wall bedroom with a sunken bed situation, and a set of cunningly camouflaged cupboards. Home design number one harnesses the potential of vertical proportions with a lofted bed installation. 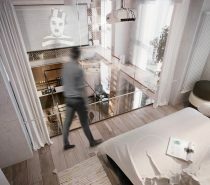 The sleeping platform is lifted high above the sofa in the lounge area, so that upon entering the home you may not even clock the upper layer. The ladders by which the homeowner gains access to the sleep space are a slimline white design to blend in with the white decor of the room. You can find more ideas like this in these small studios with lofted beds. The darkness of the sofa and the area rug draws the eye downwards, away from the loft bed. Tan scatter cushions on the sofa match with the tone of the wood veneer modern coffee table. 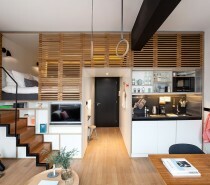 Despite the compact dimensions of this small studio apartment, a floor lamp with a huge shade has been introduced. A green kitchen loudly demands it’s very own corner of the small room. VERY INTERERSTING Inside Marvin and Rochelle Humes stunning family home – it’s got the X Factor! Home number two has a delicate soft powder blue, beige and white colour scheme. Golden accents shine from the modern chandelier and wall sconce. A small beige sofa is pushed right up against the end of the kitchen run, sitting flush between the base cabinets and the external wall. A window seat, which spans the entire width of the narrow room, provides some extra seating space if guests should call. Directly in front of the sofa is a tiny dining table chair combination in blue and white. Beyond the dining area, an extravaganza of storage units serve many different purposes along the full length of the room, beginning with a dedicated home office space. Next in line, the run of storage becomes a media console and TV wall decor, before transforming into closets and hall furniture. Patterned floor tiles span the home entryway and the blue kitchen. 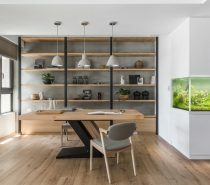 Located in Kiev, Ukraine, the project area for our second featured design is just 40 square metres. The designers interpreted the femininity of the homeowner through use of light wooden furniture, smooth edges and rounded shapes. We can see examples of this in the unique sofa and the modern coffee table. Beyond the lounge we catch a glimpse of the bed behind a glass partition. A heavy grey drape can be used to screen the sleep space opaquely from view of the sofa. 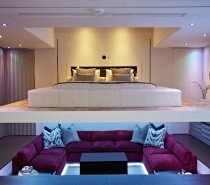 The double bed is flanked by a raised false floor, creating the illusion that the bed has been sunken into the ground. On top of the raised level, a dressing area stands to one side of the bed, in front of large windows. A row of grass grows at the base of the windows in lieu of a real garden. An indoor plant adds to the nature theme. The black and wood tone decor scheme becomes more dramatic and cosy by night. Aside from indoor plants, green accent furniture has been introduced to the interior to evoke a garden feel. Two green dining chairs and one yellow chair are seated at a dining table that is of one continuous piece with the top of the dresser. The bespoke dining table is lit along its length by two black dining pendant lights. Аlmost all the furniture in this home is custom made, in birch and oak woods. The contrast of deep ebony floors emphasise the light and fresh nature of the light natural woods. The remaining area, on the opposite side of the central wall, lends itself perfectly to being a reading nook. The bespoke bench and bookshelves are bathed in natural light from another large window. Black and light wood decor continues into the bathroom. Coffee mugs and a unique pitcher transform the dining bench into a coffee bar. A frameless shower screen almost disappears against the blackness of wall tiles. A wall mounted vanity unit keeps the floor area looking at its maximum. Finally, our fourth small space apartment greets us with some more green accents. The modern dining chairs are green acrylic, and have been matched by green drinking glasses; a blue front door completes a gorgeous combination. Distracted by the splash of colour, we almost don’t notice the huge recessed storage closets that line the room, white doors camouflaged against white walls. The bathroom door too falls away from plain sight, with its white slab door set into plain white decor. Patterned wallpaper on the headboard wall distracts the eye further. Jade green curtains and pillows accent the white bedroom scheme. Two gold modern wall sconces are affixed to a white headboard, matching the golden accents of the bedside tables. The bedroom pendant lights are the Flowerpot VP1 Pendant. Wooden wall units warm the look of the white kitchen. A huge floor to ceiling frameless mirror creates the illusion of added space. The indoor plant lit by a gold designer table lamp here is a Madagascar dragon tree.